Venezuela Is Descending Into Chaos. Now This Issue Is on America’s Doorstep. The number of Venezuelans applying for asylum is up 168 percent in fiscal 2016. Earlier this year, Venezuelan journalist and political scientist Francisco Toro described his home country as “the world’s most visibly failing state.” And now, amid a worsening economic crisis, a crackdown on political opposition, and increasing violent crime, more and more of his countrymen are seeking haven in the United States. 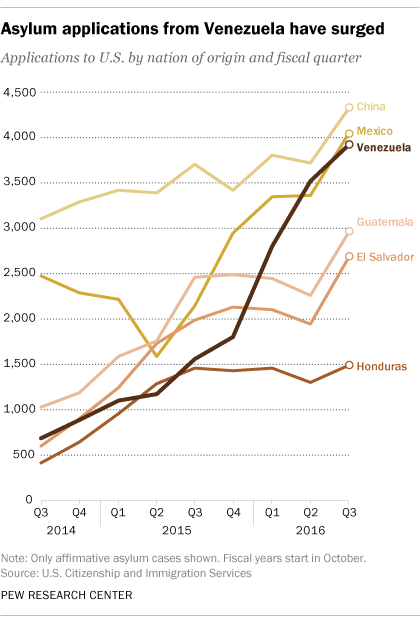 Over the past year, the United States has experienced a surge in asylum applications from Venezuela, according to new data from the Pew Research Center. So far in fiscal 2016, applications from Venezuela soared past 10,000, an increase of 168 percent compared with the fiscal year 2015. Venezuela’s economic collapse has been making headlines for more than a year. Oil prices plummeted, and price controls led to shortages of basic staples like food and medicine. A recent study from Simón Bolívar University found that 9 out of 10 Venezuelans can no longer afford to buy enough food. Now, people wait in line for hours for essentials like rice and cooking oil, sometimes even fending off armed thieves. As food riots became a daily occurrence, President Nicolás Maduro—who succeeded Hugo Chávez after his death in 2013—put the army in charge of rationing. Food is now transported by armed guards, and police protect against looters. The International Monetary Fund has estimated that Venezuela’s inflation rate will reach 480 percent this year, and more than 1,600 percent next year. Unemployment is around 17 percent and is expected to grow to a quarter over the next three years. On top of all that, Maduro has been cracking down on his political opponents. In December, the opposition coalition won a major victory, securing a majority of seats in parliament for the first time since Chávez came to power in 1999. After that, Maduro intensified his crackdown. The Venezuelan Penal Forum, which tracks human rights abuses, counted 96 political prisoners in June, compared with just 11 when Maduro became president. Meanwhile, election officials signaled earlier this week that a long-promised recall election to oust Maduro would have to wait until 2017. So far, Henriquez says, most of the Venezuelan asylum seekers he’s encountered have been middle-class people who’ve come to the United States via a student or tourist visa and then applied for asylum after their arrival. It’s quite a contrast to the Central American families showing up at the US-Mexico border, a situation which advocates have warned for years amounts to a refugee crisis. Faye Hipsman, an analyst with the Migration Policy Institute, says some Venezuelan asylum applicants may be taking advantage of excessive backlogs in the application process—delays that allow applicants to stay in the United States for years pending the outcome of their claim. And while many are likely fleeing poverty, hunger, and general violence, Hipsman says, it’s often not enough to qualify for asylum, which requires applicants to prove that they risk persecution based on their race, religion, nationality, political opinion, or social group. Thousands of Central American Kids Are Back at Our Border. Here’s What You Need to Know.